We had another sporting weekend, but this time it was watching it. 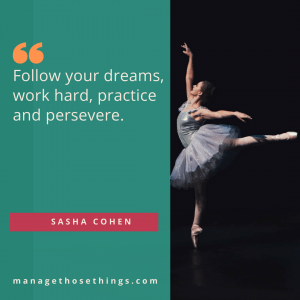 This quote from Olympic ice skater Sasha Cohen sums up what inspired and made the family exclaim “wow”, (amongst other things! ), at the weekend. Whether you follow sport or not, learning that someone has been at the top of their game, crashed and burned, then fought their way back to being at the top of their game again, 16 years later is truly remarkable. I’m talking Tiger Woods, (Golf), here. But then that’s quickly followed by those “amazing” (read bonkers in my book), cyclists who are currently riding for 5 or 6 hours each day across France. And some still have the energy to sprint for the last 5km! How much practice and perseverence do these athletes put in to follow their dreams? They work hard, and simply practice practice practice. Every day. What would your business look like if you practiced more and persevered more? Mine would be bigger. I’d be helping more people to grow themselves and their business. So why haven’t I done it if I know all the theory? Yes, probably the same reason as you. I haven”t always believed in myself. My talents, my abilities, and even if I’m on the right track! That feel familiar? Yes, you’re really not alone in wondering all these things. How do you feel when you put in so much work and effort on something, and you get no clients, or sales from that piece of work or idea? I often feel silly. But what if, that new idea or product was just so new to those around you that it took them time to understand what it was all about? What if, you persevered and kept talking about it, in different ways, or working out how your product or service could offer the solution your customer is looking for? What if the timing just wasn’t right before? What would happen if you persevered? So, with this in mind, pick one thing that you’ve put to one side recently that you know is a good idea but hasn’t “worked” yet. What can you do to share with your audience again and keep talking about it, and persevere with it. Today I’ve started a Stay on Track programme in the Business Cheerleading Club, aimed at those who have less time to spend on their business in the summer with children being at home. This is a group programme offered as part of the monthly support. We’ve already had one business owner say, “ah ha!” and get some clarity on what their focus will be for the next 6 weeks. I’d be delighted if you wanted to join us for this. Or, if you’d prefer 1-1 support, then I’ve still got 5 places left on the summer holiday programme. 6 x 20 minute focus sessions for £132. The idea being you have 20 minutes a week for 6 weeks which keeps you focused and on track, putting things in place for when you’re back to full hours at the end of the school holidays. So if this would help you, please get in touch & book your place today. By asking for help, and saying things out loud, you can help yourself work things out. If you need someone to listen to you, please book a free Explore Call (20 minutes), and let’s work things out together.